SCAW participates in the Sister Cities International Annual Young Artists Competition. High school students from New Hanover County and our sister cities are offered the opportunity to participate by entering their own artistic interpretation of a selected international theme. Cash awards are given to the top three entries from New Hanover County and the artists can advance to the international level, which offers a scholarship award to the winning artist. leisure and pop culture through pen pal programs and more. Click here to learn more about setting up an exchange. Graduate level students from the University of North Carolina at Wilmington have had the opportunity to live and teach English for a full academic year in Dandong, our sister city in China. to create art and promote cross-cultural understandings. SCAW hosts dinner meetings periodically throughout the year in area restaurants. Members get to enjoy international cuisine and have conversations with students, teachers, artists and world citizens about diverse global topics. SCAW participates in local festivals celebrating different cultures in an effort to increase community outreach and participation. SCAW works with other organizations, such as UNCW, on special events. One such event was a UNCW International Student reception held September 1, 2009 at Wilmington City Hall. Click here to view photos from the reception. 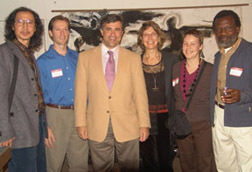 (l-r) Dandong artist Wei Ru, former Sister City Commission Chairman Scott Czechlewski, Wilmington Mayor Bill Saffo, No Boundaries Co-director Gayle Tustin, Doncaster artist Ellie Collins, and Barbados artist Neville Crawford attend a SCAW reception for the artists. A St. Mary's student shows off a package from a Doncaster class.